Early in the school year, while giving a Navi class, one of my 5th grade boys asked a beautiful question on the subject matter- a truly thoughtful and pertinent question. Instead of giving him the answer, I noted what an excellent question it was, and challenged him to spend the weekend doing some research to find the answer on his own. He did just that. Together we created a Drasha from his answer, which he then presented to the class. 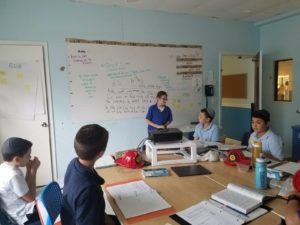 Seeing that child take ownership over the process, and his pride in presenting his accomplishment to the class, highlighted an important component in education that I had, until that moment, overlooked. That was the day that The Young Acharonim was born. 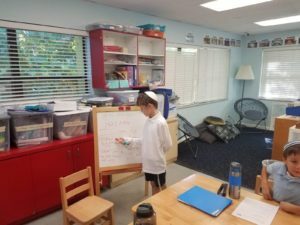 The Young Acharonim is an integrative environment where, using the ancient methodology used in the Talmud, students are able to hone their critical thinking skills. As a teacher, there’s nothing that makes me more proud than hearing a student ask a question during class that shows me he’s been thinking critically. How can we encourage our students to exercise their critical thinking? By calling our students ‘Young Acharonim’ we are empowering them, telling them that their contributions to Torah are valid and important, and that we want to publish it, or teach it to their friends! Now that question they asked in class? It still needs an answer. That is where they use the guided templates of The Young Acharonim to research independently, answer their question, and hold in their hand a beautiful, finished product: Their very own Drasha! The process begins with ‘Three Possible Answers’- or ‘3PA’ as my students have begun to call it. Fact 2: G-d decreed that the Aron would be taken. Fact 3: The fact that the Philistines took the Aron was not really their choice. Possible answering point for fact 1: Hashem is looking for a reason to punish the Philistines. Possible answering point for fact 2: A Prophecy doesn’t always need to come true. Possible answering point for fact 3: The Philistines made a conscious choice to take the Aron, and for that they were punished. **An important thing to note about the 3PA process is that the above ‘possible answers’ are thoughts that the students came up with on their own, and then proceed to research. The ‘answers’ the students first come up with don’t need to be correct, or even very good. They just need to demonstrate that the student is analyzing a problem from multiple perspectives. 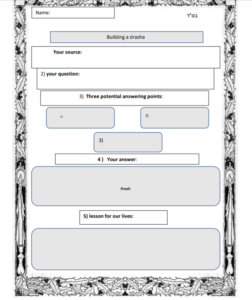 The students are given the attached template chart to work through the process and ultimately find the correct answer. The Drasha must contain a source, and a relevant “Hora’ah”- a lesson in practical life. The Drasha must also contain background of how the question came up in class, and any other relevant background information. When the entire chart is filled in, the child has completed their Drasha, and is ready to share his findings with the class, if he wishes. 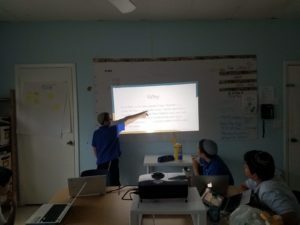 My students have gotten very creative with this part of The Young Acharonim,- I have even seen then create their own powerpoint presentations! Additionally, I have been collecting the students’ Drashot to publish in a bi-annual publication for their parents, and for the rest of the school. Imagine the satisfaction of seeing their work in print! The Young Acharonim helps students develop their higher level cognition, specifically in the skills of ‘Analyze, Evaluate and Create’ according to Bloom’s Revised Taxonomy of Cognitive Skills. Analyze: The students study the material covered in class, and analyze the information to come up with novel questions. They are encouraged to ‘dig deep’ and really think ‘outside the box.’ They then further break down the question into its core components. Evaluate: The students evaluate the material covered in class to discover inconsistencies and contradictions, additionally the students assess the answers they provide in the 3PA process, and then conduct thorough research the subject to select the correct answer. The students are also encouraged to challenge their friends’ work, further evaluating the information. 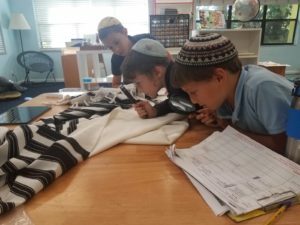 Create: Through the various steps of The Young Acharonim process, the students create a Drasha. They further use that Drasha to create a presentation for their classmates. The Young Acharonim has enriched the learning environment in my classroom immensely. When the students take ownership of their own learning it propels them forward in their studies and the sense of accomplishment brings warmth and positivity to every subject. Seeing the success of this ‘pilot’ program of The Young Acharonim, I want to modify the principles of self-directed learning to be applied for older and younger children in our school. My name is Rabbi Mendel Kugel, and i am very passionate about jewish education. I decided to do something about it, and thus far we have been met with blinding success.